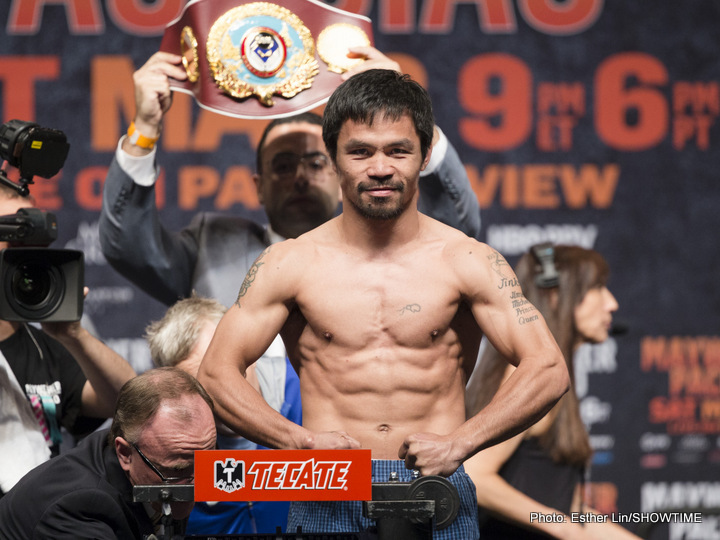 By Chris Williams: Manny Pacquiao will be fighting on April 14 on ESPN PPV, according to Top Rank boss Bob Arum, and then fighting Vasyl Lomachenko in November. That part of the news comes from Pacquiao’s trainer Freddie Roach. Pacquiao and Lomachenko will fight at 140, says Roach. Of course, the 86-year-old Arum will need to be the one that announces that fight, not Roach. We have to wait until Arum lets the boxing world know about the Pacquiao vs. Lomachenko fight. Pacquiao is expected to be fighting on the April 14th ESPN PPV card against Mike Alvarado in a warm-up fight at Madison Square Garden, in New York. It’s the same card the Jeff Horn vs. Terence Crawford fight. “Lomachenko’s next fight will be at 135 lbs and he and Manny will meet at 140 (later in the year),” Roach said to the Manilla Bulletin. Lomachenko lacks the punching power to hurt Pacquiao, so this fight will come down to which of them has the speed, power and endurance to win. Pacquiao is still stronger and faster than Lomachenko. He’s also bigger than him. Lomachenko is younger and he could win based on his defensive skills and his conditioning. Pacquiao was gassing out in his last fight against Jeff Horn on July 2. Pacquiao did not look like he had the stamina needed for him to put Horn away when he had him hurt in the 9th round. Roach is letting the cat out of the bag by telling the boxing fans about Pacquiao fighting Lomachenko. This is a big fight that will interest a lot of people. With the Pacquiao fight being offered to Lomachenko rather than Crawford, it gives an idea of who of Top Rank is pushing to turn into a star. Lomachenko might be seen as the more marketable fighter of the two. Lomachenko is certainly performing better in his fights right now than Crawford. You don’t see Lomachenko running from his opponents. If the 29-year-old Lomachenko beats Pacquiao, it’s going to give his boxing career a big boost towards turning the 2-time Olympic gold medalist into a star in the sport, especially if he stays at 140. Lomachenko will be close enough to the welterweight division to get the top fighters to face him for big money fights. A victory for Pacquiao would help his career as well, because he would be getting a huge win over a very good fighter in Lomachenko. Arum might then make the move of matching Pacquiao against Crawford, although I don’t see that fight happening. Pacquiao is still too useful in making fights against guys that he can beat and make good money fighting like Adrien Broner, Amir Khan and Danny Garcia. “It will be on the same night Jeff Horn and Terence Crawford will fight for the (world welterweight title),” Arum said to the Manila Bulletin. “We’re just waiting and we will do the announcement once Manny’s on board,” Arum said. This has got to be a big blow to Terence Crawford, because he’s been hoping to get a fight against Pacquiao for a long time. Pacquiao is fighting on the same card as Crawford on April 14 on ESPN pay-per-view. Having the 2 of them fight on the same card would be the ideal way to setup a fight between them later this year, but it doesn’t look like it’s going to happen. Pacquiao will fight Lomachenko, and Crawford will have to be satisfied with whoever Top Rank can dig up for him. Crawford would be passed over by Top Rank for the Pacquiao fight in favor of Lomachenko. It doesn’t take a genius to figure out why Top Rank would give Lomachenko the fight against Pacquiao rather than Crawford. Lomachenko is being compared to Muhammad Ali by Arum. When you hear a promoter talking like that about their fighter, it tells this is the guy that he’s going to be making a major push to turn into a superstar. Arum hasn’t been saying that Crawford is in the same league as Muhammad Ali. Crawford will be fighting WBO welterweight champion Jeff Horn (18-0-1, 12 KOs) on April 14 on ESPN PPV at Madison Square Garden in New York. Horn should have already gotten a rematch with Pacquiao, but the Filipino star couldn’t get time away from his senatorial job to face the Australian in a second fight. Arum went ahead and scheduled a fight between Crawford and Horn, which isn’t nearly as good for the Australian as it would have been had he gotten a second fight with Pacquiao. Lomachenko was said to have been negative to the idea of fighting the 39-year-old Pacquiao. It’s unclear what has caused Lomachenko to change his mind. Lomachenko’s manager Egis Klimas said recently that they weren’t interested in fighting Pacquiao because he was an old timer. It looks like Arum is the one that is making the decision for Lomachenko. Arum obviously sees things clearly and recognizes what a fight against Pacquiao could do for the career of Lomachenko. It’s a fight that would make Lomachenko a household name in the United States. There isn’t anybody else for Lomachenko to fight within the range of his weight class for him to get the same attention. Lomachenko is too small to fight Gennady Golovkin and Saul Canelo Alvarez. Floyd Mayweather Jr. isn’t going to make a comeback to boxing just for the benefit of fighting Lomachenko and helping his career. It’s Pacquiao or nobody for Lomachenko. It’s pretty rich that a fighter that has little interest in fighting Pacquiao is now in the position to get the fight against him in November. Lomachenko’s ambivalence about the Pacquiao fight has gotten him the fight. On the flipside, Crawford has been chomping at the bit to get the fight against Pacquiao for years, and he’s now finding himself passed over by Top Rank. This is hilarious. I guess there’s a message in there somewhere. It’s best not to be too eager otherwise you blow your chances completely. It’s not all bad for Crawford getting passed over for the Pacquiao fight. At least he’s in position to win the WBO welterweight title from Jeff Horn on April 14th. That’s a positive. Crawford will need to put some pressure on Arum to line him up with some of Al Haymon’s top welterweights like Errol Spence Jr., Shawn Porter, Danny Garcia and Keith Thurman. If Arum can’t or won’t do that, then Crawford is going to be isolated as the WBO welterweight champion and stuck fighting the likes of the Top Rank stable fighters like Jose Benavidez, Konstantin Ponomarev and Mike Alvarado. Crawford will never become a star in that case. He’ll be stuck in the same position he is in now, a non-PPV fighter.